The logo for the current productions of Macbeth, now on stage at the Folger Theatre, features several technicolor profiles of an owl as it hovers over a witches’ cauldron. 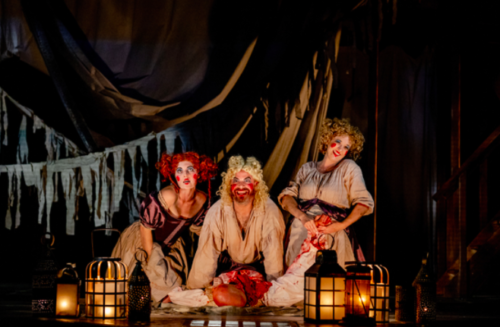 The intersection of supernatural spells and owls –all-seeing, fierce, focused on their prey, and a bit spooky– is a teaser for the mayhem that awaits theatregoers in this atypical production of one of the Bard’s most famous tragedies. To kick off the Folger’s 2018-19 season, director Robert Richmond brings his own vision and style to this Restoration-era production, adapted by Sir William Devenant in the 1660s. An international team of scholars collaborated to amend the traditional text, sharpened its political edge and called on the Folger Consort to integrate pastoral Scottish tunes and period baroque music for the chorus and the witches. Oh, the witches. In my mind, Macbeth is not so much the star of this performance as are the operatic witches, (Rachel Montgomery, Emily Noel and Ethan Watermeier) rouged and intensely unnerving, as they frame the performance and lure the Scottish king to his dastardly acts, ensuing insanity and ultimately, his death. Death is everywhere, and it is gruesome. The witches do add a bit of comic relief to the somber play and their puppet-like movements and choreography bring to mind clowns– creepy clowns. Ian Merrill Peakes and Kate Eastwood Norris as Lady Macbeth, his treacherous bride, navigate ambition, greed, power and government on a stage framed by iron gates restraining inmates and hung with tattered rags. Cheering for MacDuff is to be expected, and Chris Genebach gives us an honorable, if heartbroken, hero. The staging for the final fight scene between Macbeth and Macduff is a gruesome ballet of sorts, orchestrated between a fringe of bed sheets ripped to shreds by the insane residents of Bedlam. Yes, mental health, or the lack there of, plays a starring role in this production. This Macbeth, when first produced was a play within a play, staged as a fundraising event for Bedlam, the mental asylum in London, two weeks after the Great Fire of London in 1666. Act One begins with inmates of the asylum rehearsing their roles, later to reappear to scream from their cells and act out King Duncan’s (Louis Butelli) gruesome murder. Bedlam ensues, indeed, in this shadowy world, filled with sound and fury, of violence and mayhem. The sweet and sonorous sounds of bagpipes and the melodic witches are a stark contrast to the dark deeds and bloody acts depicted in the shadows of the stage, transformed into a macabre funhouse. Tonight the Folger will host Brews and Banter at 6:30 p.m. Participants can enjoy craft brews from Bluejacket Brewery and a casual behind-the-scenes conversation with cast members. Tickets are $15. A post-show talk with the cast scheduled for Thursday, September 20, following the 7:30 p.m. performance.